The market can be indiscriminate in tearing down and building back up sectors and the stocks within their walls. But at this very moment homebuilders D.R. Horton (NYSE:DHI) and Beazer Homes (NYSE:BZH) are busy constructing strong platforms for bulls and bears, but ones made more solid as an options-based pairs trade. Let me explain. Within the homebuilders group and if we’re to believe charts are leading indicators of economic or business activity; DHI stock is a standout. Shares of D.R. Horton have been under pressure of late. But don’t mistake that for anything other than an opportunity for value-minded investors to get long DHI shares! Bottom line, DHI stock sports top-notch fundamentals and recently topped the Street with an earnings and sales beat. And regarding that other important squiggly line on the price chart, DHI has been demonstrating equally strong technical leadership relative to its peers and the SPDR Homebuilders ETF (NYSEARCA:XHB) by hitting and maintaining new highs in 2018. It’s our view that DHI stock is one to own in anticipation of the supportive base being built on top of D.R. Horton’s prior all-time-highs from 2005 (set during the housing bubble). And if we’re correct, today’s bullish construction should lead to a continued bull run over time for DHI. I like approaching DHI stock with a slightly out-of-the-money bull call spread. This strategy reduces and defines the trader’s risk and doesn’t open up the trader to additional downside exposure. This type position can also begin to turn a profit if shares merely reaffirm the uptrend, but really deliver some nice bang for one’s buck if new highs are reached. Reviewing the options market in D.R. Horton, one combination that looks attractive is the February 2019 $47/$55 call spread. With shares at $44.28, this spread is priced for $2.34 or less than 5% of the risk associated with holding DHI stock and can capture as much as $5.95 or more than 250% if shares are above $55 at February expiration next year. 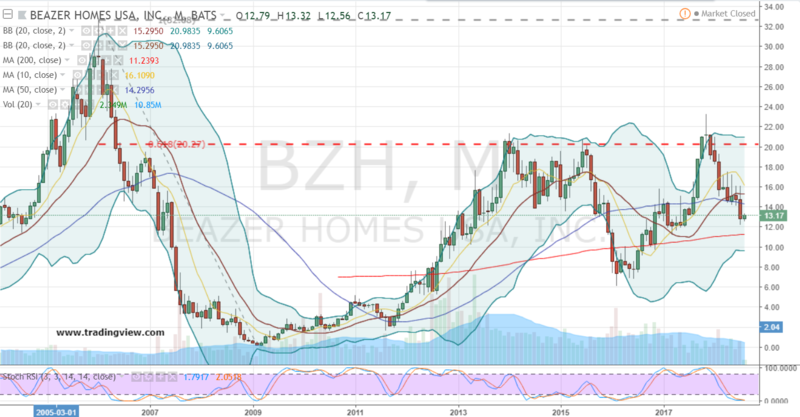 For the second piece of our pairs trade, BZH stock is a homebuilder that looks well-positioned for continued weakness on and off the price chart. The company’s fundamentals are much spottier than DHI’s and on the price chart that also suggests BZH’s best days may be long behind it. Unlike D.R. Horton’s shares, BZH stock has not only failed to reach new highs in recent months, it has actually sent bulls scurrying as a breakout above the 62% retracement level from its high in 2006 quickly failed and went on to establish a bearish shooting star topping pattern. Subsequent action in BZH stock has resulted in continued relative weakness in 2018. And while it’s technically true that a bullish higher low could always change the character of the price chart — for now, we’ve found a bear that looks and smells like a bear within a pairs trade on the homebuilders group. 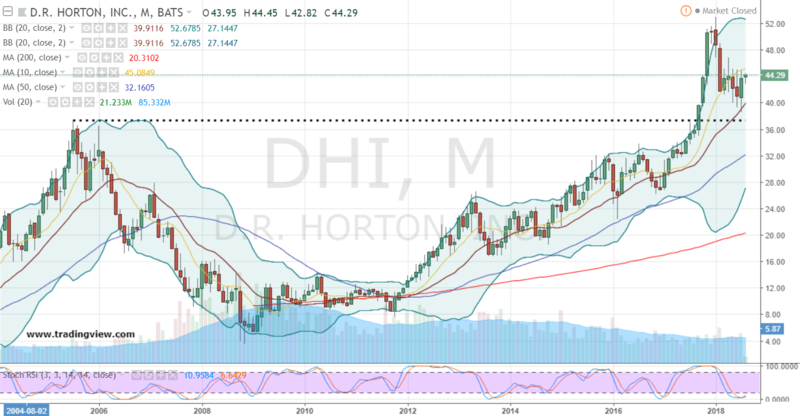 Similar to DHI, I like using a vertical strategy in BZH stock. This time the focus is on an out-of-the-money put spread for profiting in anticipation of continued weakness in shares. After checking the options board in Beazer, the February $12/$10 bear put spread for 48 cents with BZH at $13.47 is favored. If Beazer proceeds lower, a profit of up to $1.52 below $10 is possible at expiration. And if shares cooperate sooner rather than later, the opportunity to make a quick and profitable adjustment of some type, is generally a proactive move which can’t be faulted. Lastly, in in the event market conditions in BZH stock don’t go according to plan, it’s nice to know that with short exposure minimized to about 4% of the Beazer share price, this bear won’t risk getting painfully declawed. The post An Options Pairs Play in the Homebuilders Group: DHI and BZH appeared first on InvestorPlace.